You are invited to our 2nd annual carnival on April 14, 2018. 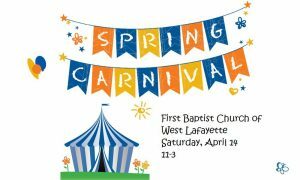 This years carnival will be held at First Baptist Church in West Lafayette. First Baptist is located at 688 E. Main St. in West Lafayette, Ohio. This is a free event and is for the entire family. Come and enjoy a fun day of family fun for all ages. For more information contact First Baptist Church at 740-545-7864.